I’m going to be honest here folks, I really enjoy perusing the Internet in search of delightful recipes, anecdotes, inspiration and news (mostly about my favorite craft brews). There’s nothing like grabbing an afternoon snack and taking a moment to escape from your day while reading what your favorite blogs have to offer. Blogging has been around for a while now and has become a popular platform for people to share their interests with the online world. It especially has become a major component for business development and online marketing. So, for the sake of camaraderie and the need to share our favorite things I have picked three of my favorite blogs to analyze why they work so well. I have been following the Pioneer Woman’s blog for quite some time now. Originally, I found myself visiting her blog quite regularly in search of savory recipes and delicious snacks. Before I knew it I was hooked and checking it on a daily basis. The thing I love most about The Pioneer Woman is her distinct voice. She has such a wonderful personality and it really shines through in her writing. I truly admire this, as it is not easy to write informative blogs in a voice that is light and fun, yet still knowledgeable and instructional, such as recipes. This is a very thin line content writers and bloggers walk every day! Since my first visit, her blog has evolved into a beautiful website that is a reflection of her flowery personality. The fancy scrolling font and beautiful border of flowers is truly a website design that says, “I am Ree, I am the Pioneer Woman!” It’s easy to navigate between the cheerful anecdotes of her “confessions”, her vast library of recipes, and the tips and advice her friends have to offer. She even has a section that is dedicated to give-aways! But in the end, her beautifully designed website would be nothing without the voice that is the Pioneer Woman. Hence the reason almost all of my dinner ideas stop and end there. The author’s voice is the foundation to any blog or online marketing copy. Without it, it’s just words on a screen with no relevancy or connection. This Is Colossal is quite easily one of the most inspirational blogs I visit. Besides coffee, it is usually one of the first ways I start my day. Not only does it offer great online marketing and exposure for artists from across the world, but the website design is simple. As a result the reader can focus on all the wonderful artistic works that are being showcased. Because of This Is Colossal I have been exposed to so many different artists and mediums. It truly is wonderful being able to enjoy such creativity and it usually inspires me to go out and be creative too. Creativity is what makes a blog unique and interesting, which keeps readers coming back for more! This Is Colossal also makes it convenient to learn more about whatever artist catches your eye by providing links. This lead the reader to the artist’s original page or further into their works/exhibits. Linking to relevant sources and topics is yet another important characteristic of blogging, and This Is Colossal nails it. Their website design is so easy to navigate too! If you are after a certain source of creativity and want to look back on something that truly inspired you, it’s as easy as searching through their archives or selecting any of their already listed topics. The last blog to be mentioned is The New School Beer. This one is especially awesome because not only is it local, but it also focuses on the burgeoning craft brew industry of the Pacific Northwest. 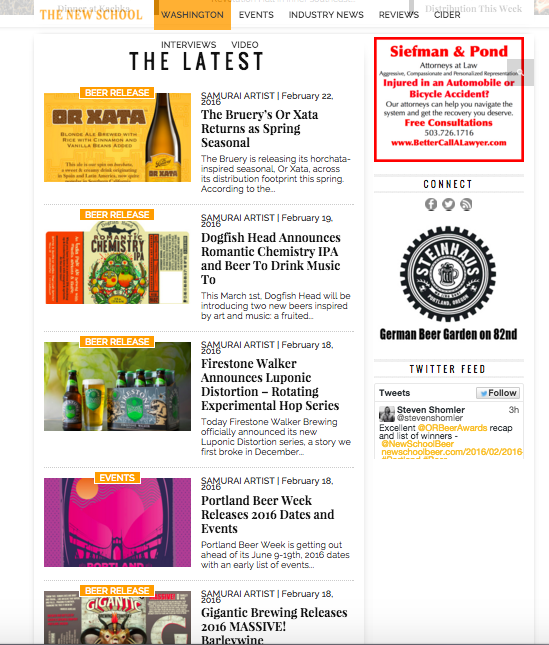 The website design and layout always gets me pumped up to read some news about the craft beer industry. The top of the page scrolls through some of the most recent blogs. So if you see something that catches your eye, simply click and your front and center to the article of your choosing! New School Beer is especially good at keeping you up-to-date on the latest trending happenings. Such as beer releases, tap takeovers, beer festivals and new breweries or tap houses. Though, I am a fan of keeping up with my favorite breweries from their personal social media pages, I find it wonderfully convenient to have all this information in the same place. I also enjoy being able to read over their beer reviews. It’s fun to compare notes on the brews I’ve already tried and it helps me decide on what to get the next time around. Above all else, New School Beer is always on top of the latest trends and publishing content that is relevant and timely. Which at the end of the day, isn’t that why we subscribe to blogs? So, next time you’re surfing the internet and making your daily rounds, just take a moment to tip your hat in appreciation of your favorite blogs! If you’re starting your own blog, whether it be for SEO and online marketing reasons or just for fun, keep in mind why you like the blogs you do and apply it to your own.